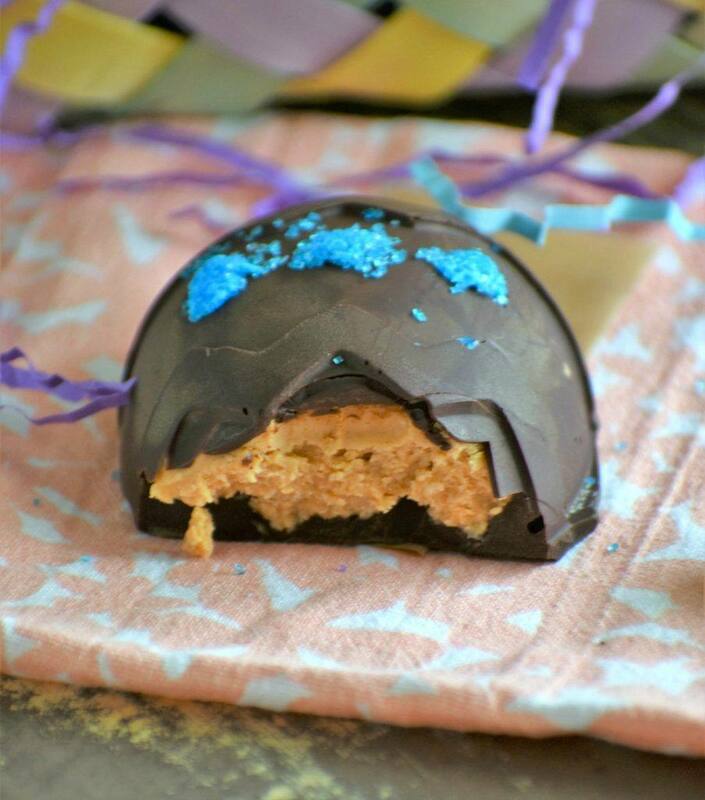 Gluten Free and Dairy Free Peanut Butter Eggs. Perfect Easter treat. 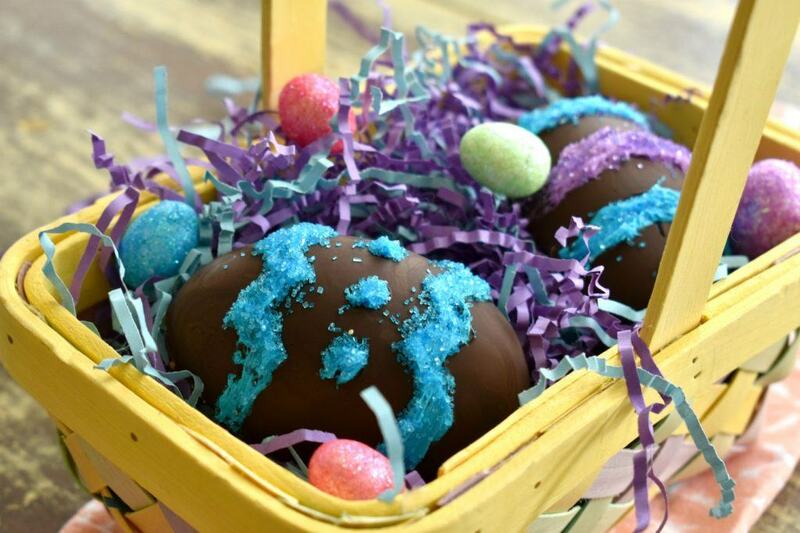 With Easter here I wanted to make a treat for my family. Everyone in this home loves peanut butter and chocolate. Unfortunately, I can not find a Gluten Free and Dairy Free Peanut Butter Egg. Luckily, they are incredibly easy to make. So, spur of the moment I decided to make my family Gluten Free and Dairy Free Peanut Butter Eggs for Easter. This post contains affiliate links. I use these links to share with you what I am using in my kitchen and home. If you purchase through these links, the website makes a small percentage. This helps to cover the cost of running this site, so I can continue to bring you delicious recipes and great content. Thank you for your support! I try not to go crazy with candy, but there always has to be a few treats in the Easter basket. I grabbed some organic jelly beans to stuff the eggs with and some allergen free Chocolate Easter Bunnies. I will also have pajamas, a book, stickers and of course these Gluten Free and Dairy Free Peanut Butter Eggs. 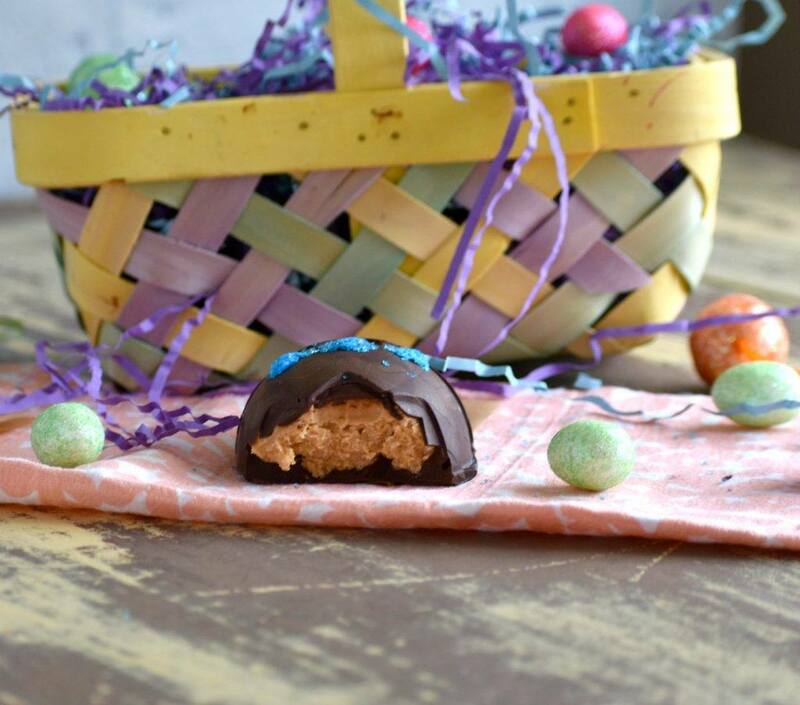 It is easy to make these peanut butter eggs as allergen friendly as you need them to be. You can use sunbutter, almond, or cashew in place of the peanut butter. If you need these to be dairy free, then you will also need a chocolate chip that doesn’t contain dairy. Enjoy Life makes chocolate chips that are top 8 allergen free and that is what I used. I also love that they are soy free and made with clean ingredients. I love how fast these Gluten Free and Dairy Free Peanut Butter Eggs can be made. They do need to be stored in the fridge though and if it is hot out make sure they stay cool. No one likes a melted and sad looking PB egg. 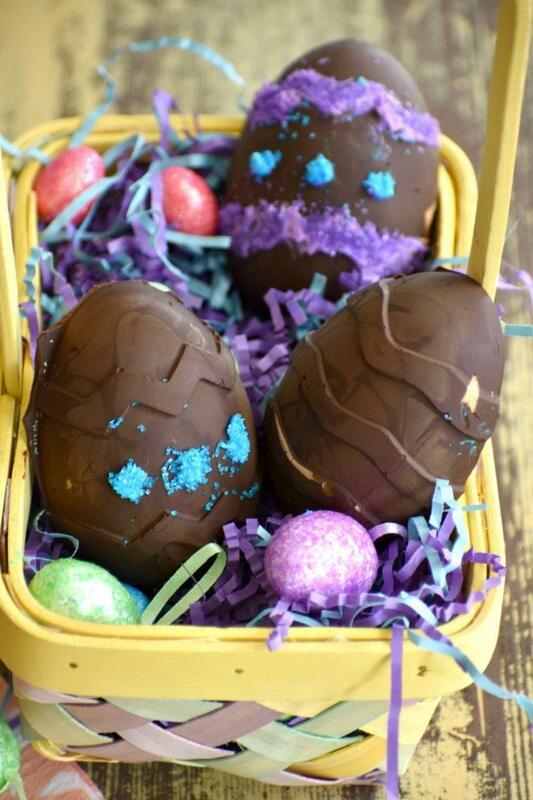 You will also need a Silicone Easter Eggs Mold for these. I tried putting buttercream frosting in the mold before pouring the chocolate and it was a waste of time. If you want to decorate the outside, then do so after they are set. I used a small paint brush to brush on the frosting and then poured matching sprinkles on it. The kids saw me making these and wanted in on the action. They helped with melting the chocolate and stirring the peanut butter mixture. 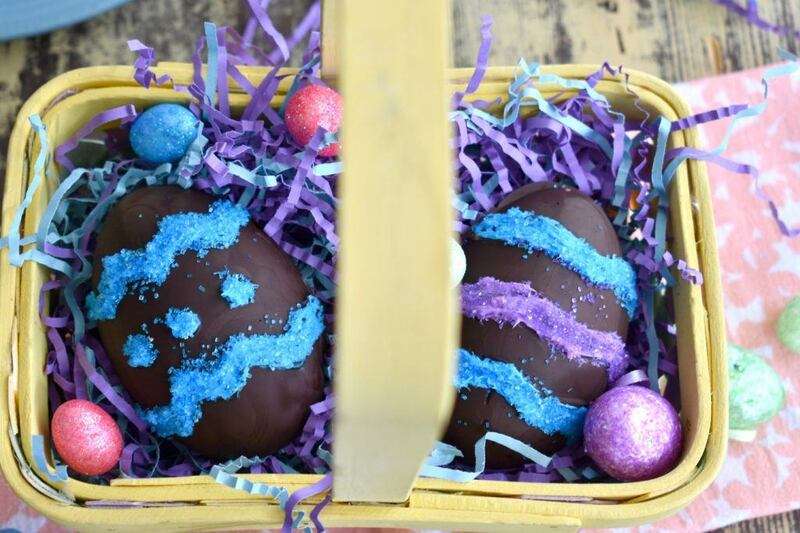 Pro tip- Just use enough chocolate to cover the bottom of the eggs. You can do this by spreading it evenly with a spoon, or picking up the mold and tilting it to coat it. After you coat the entire egg part of the mold, place it in the freezer and allow it to harden. This takes about 15 minutes. While that is setting you can mix together the peanut butter mixture. To make this authentic like the store bought eggs, you want to fill it up generously with peanut butter. Basically to the top. You can then spoon another light layer of chocolate over the top and use the spoon to spread it evenly. They need to sit for about 30 minutes in the freezer before you can transfer them to the fridge until you are ready to eat them. 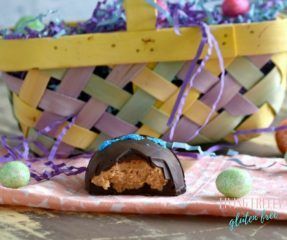 I know you and your family will love these Gluten Free and Dairy Free Peanut Butter Eggs as much as we do. You can make them in regular cupcake molds too. 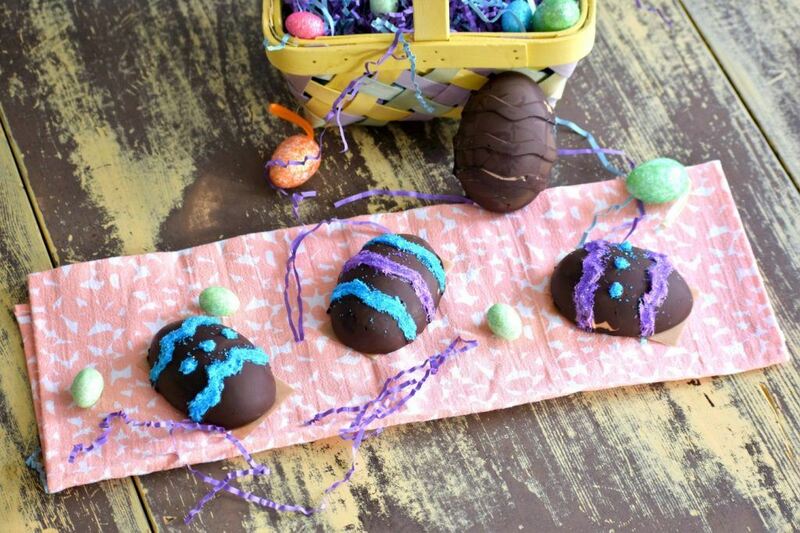 I highly recommend making these in a Silicone Easter Eggs Mold or Reusable Silicone Baking Cup . I have tried it with paper liners and they are hard to peel. They literally pop out of the Silicone molds with ease. Enjoy! These delicious treats are better than the unhealthy storebought ones. They are easily adaptable to be free of many allergens. In a microwave safe bowl, melt the chocolate chips and coconut oil in 30 second intervals, stirring well in-between. It should only take 2-3 intervals. Melt the coconut oil and then in a bowl add the oil, peanut butter, and powdered sugar. Using a fork, blend it well until the sugar is evenly mixed into the peanut butter. 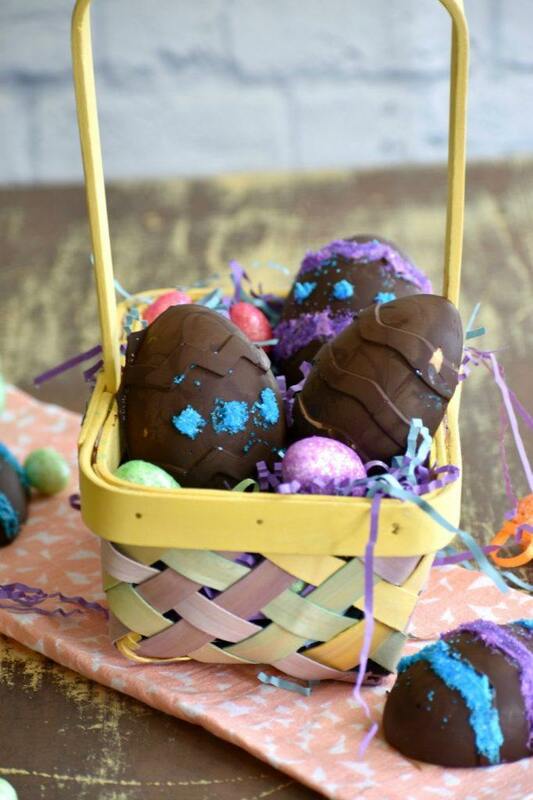 Modestly spoon the melted chocolate into the egg mold and use the spoon to spread it evenly. You do not want too much chocolate, just coat it well. You can also tilt the mold side to side to coat the egg shape even better. Place the mold in the freezer for about 15 minutes to let the chocolate set. Once the chocolate is set generously spoon the peanut butter mixture into the egg mold. Fill it to the top and spread to top to make it even. Spoon more chocolate onto the top of the peanut butter and spread it to evenly coat the top of the peanut butter mixture. Place back in the freezer for 30 minutes and then store in the fridge until you are ready to serve them. Must be stored in the fridge. If you like this recipe then you will love my cookbook full of over 100 gluten free and dairy free recipes, including my peanut butter cup recipe. They are so much better than the store bought ones. I hope you give them a try! !